Wow everything looks so fantastic. Meanwhile I'm over here with my buildings made out of lego and spray painted black. 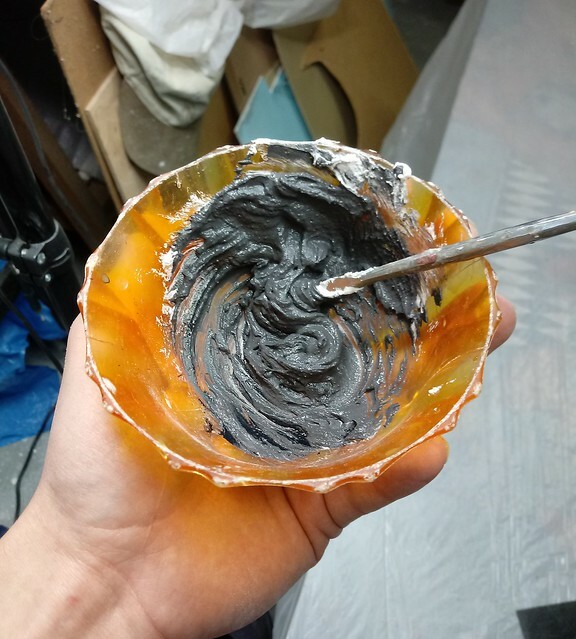 You spray paint Lego black? Sadly work has not progressed on the bushes, as I haven’t been able to locate any latex-based spray glue nearby. I finally caved in and ordered online, but I’m still waiting for it to arrive (grumble). I also didn’t have time to look for the Noch leaves, as I’ve been too swamped with work. However, I felt compelled to churn out a couple more terrain pieces for the event we’re having on Saturday. 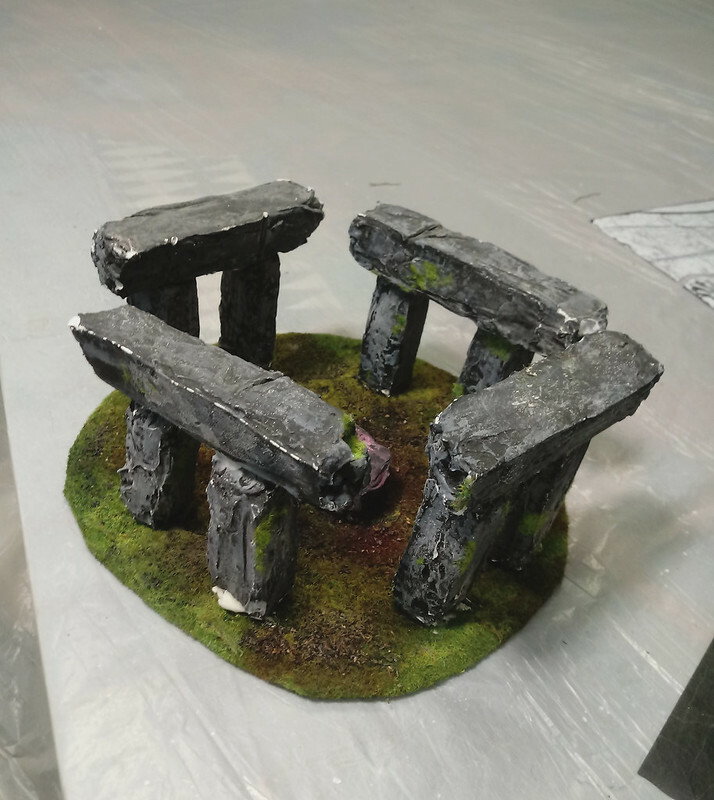 The guys usually raid their Malifaux club and borrow scenery from there, but it’s not always certain. 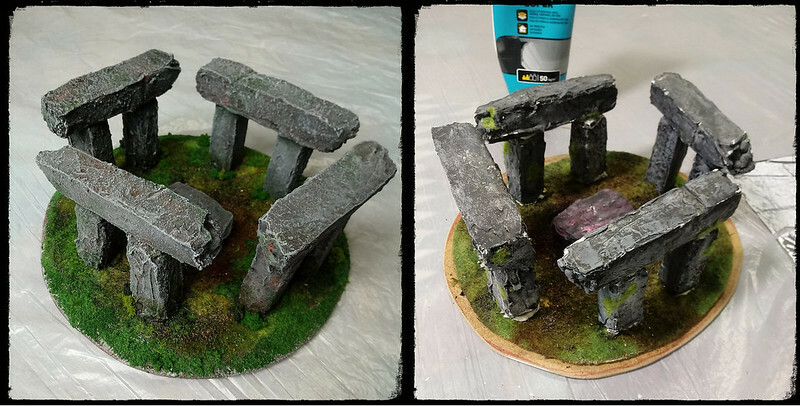 So I decided to finish off a few bits from my old terrain collection, that I felt were worth fixing. I’ve effectively re-flocked them using three colours of fine turf. Then I’ve added some coarser flock and finally tufts and flowers. 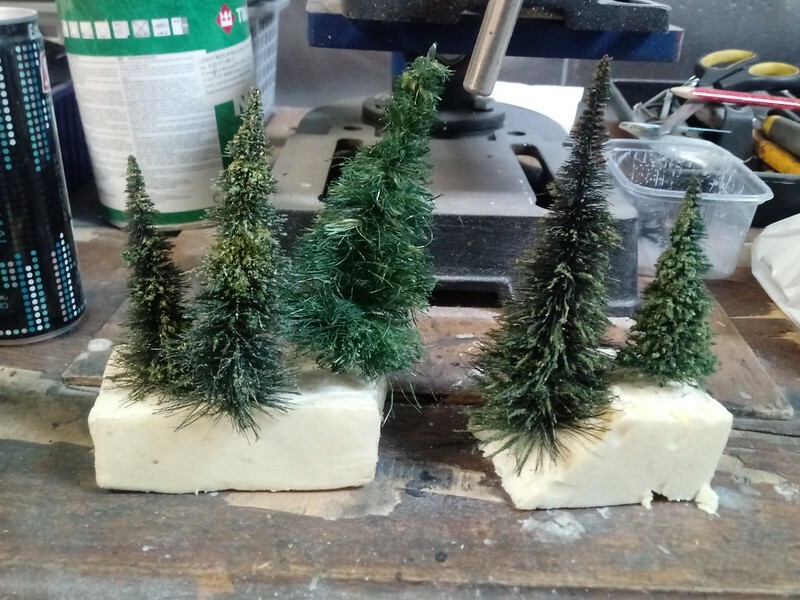 I still have to fix the spruces a bit as they have lost most of their flock , but I need the damn glue to do that. I’ve also dug out a small cromlêh type structure, that a friend of mine left in my possession. 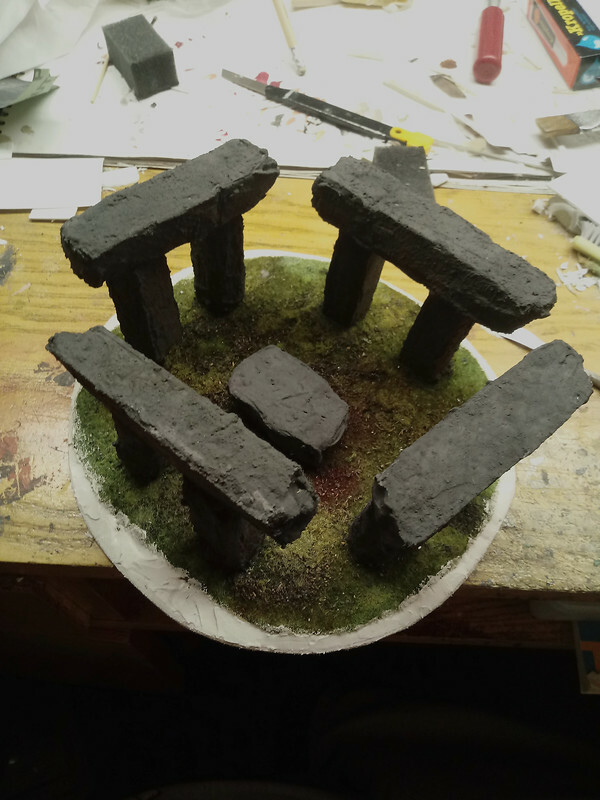 Earlier this year I did some work on it, mainly by gluing the broken stones back onto their base. I wasn’t originally going to keep this, but I noticed that the colour of the static grass used on it matched my latest efforts pretty closely. 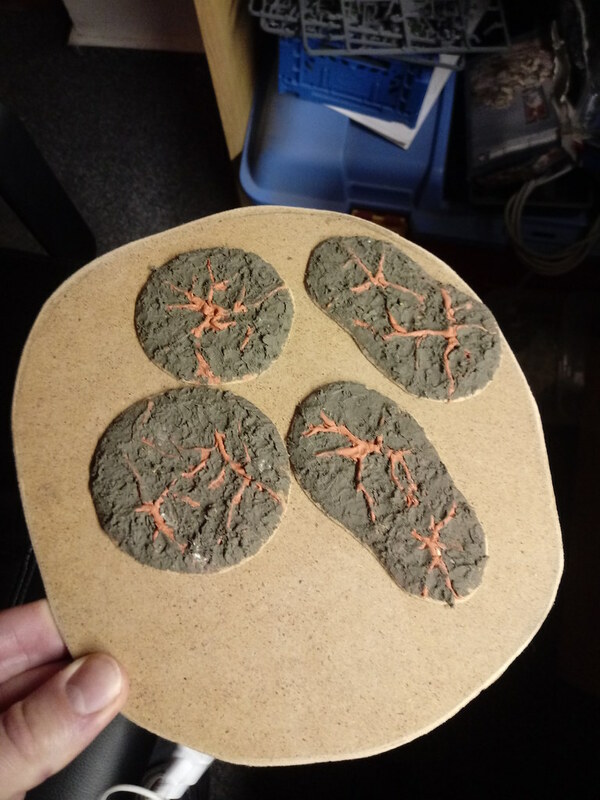 So I decided to give it a super quick facelift, as it would allow me to almost fill out an entire 3x3 Malifaux table, if I got this done in time. So the first thing was to strengthen the whole structure. As you can see whoever made this, picked corrugated cardboard as a basing material. This was obviously a bad choice, as the base was very warped and the Styrofoam stones were wobbling very alarmingly, whenever it was moved. 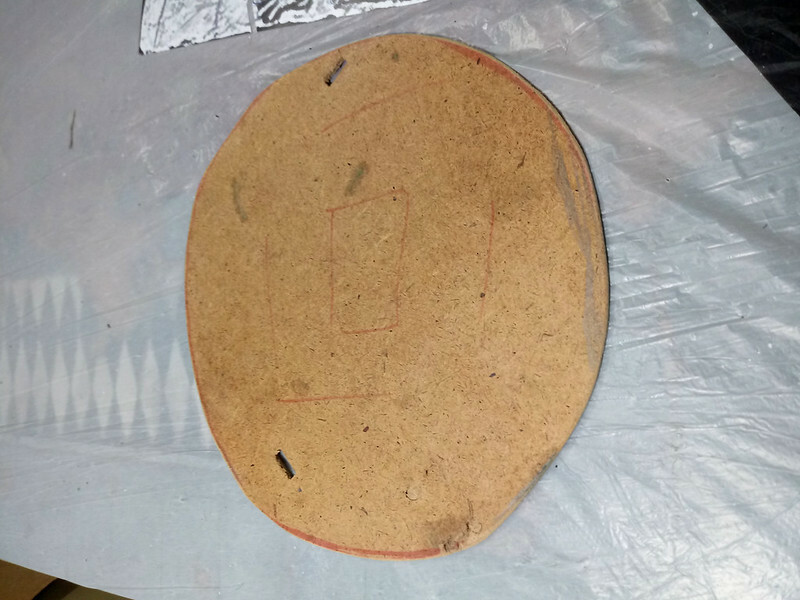 Some quick work with a jigsaw produced a snazzy looking MDF base…..after I made the first one too small that is! Next, it was time to make the stones look less silly. From what I could gather, they were made out of expanded polystyrene (the not cool kind used for packaging), smeared with some plaster, painted and covered in static grass. Not how I would go about it definitely! So after I scrapped off most of the grass I made a textured spackle mix to, make the surface of the stones a bit more interesting. 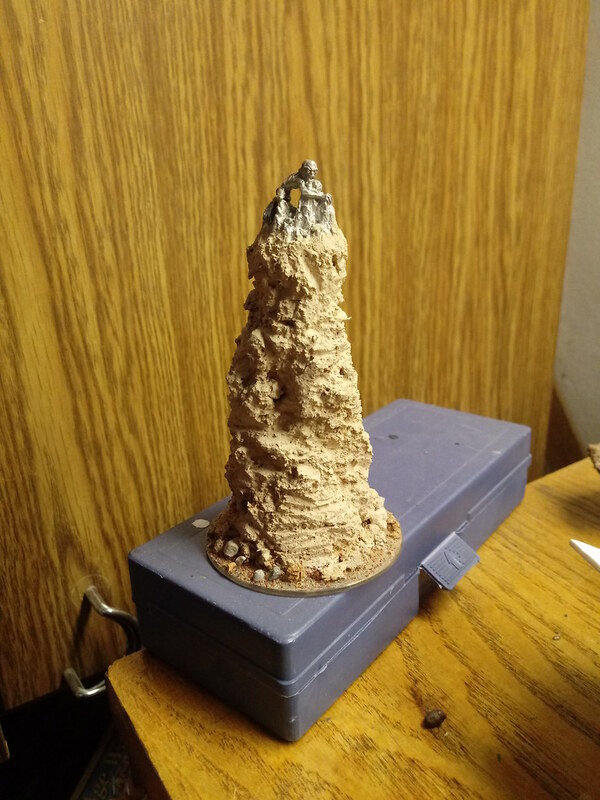 This time I chose white spackle, added in some chinchilla sand and a bit of the coarser sand I use for basing. Then I added a dollop of black and raw umber acrylic paints, to add colour to the mix and do the base colours in one go. I applied the mix it with an old brush all over the rocks, adding in a bit of water to make it flow better. 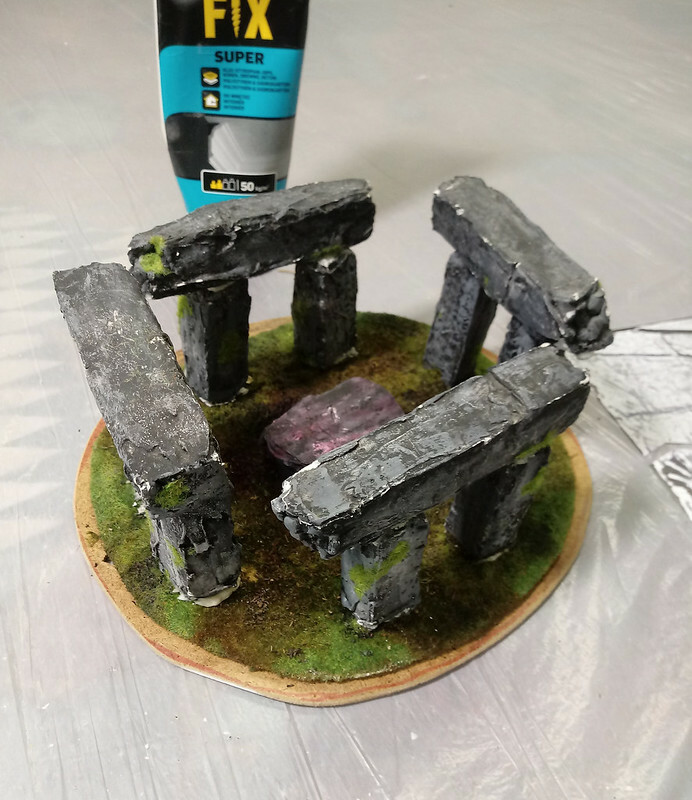 While the rocks were drying, I applied some pure filler to the edge of the base, to blend in the old base with the new one and create a little slope. I had to leave the whole piece to dry. Later I will add sand and all kinds of flock. The stones will get a solid drybrush and some washes. Maybe then I won’t feel like I’m wasting my time, as so far I remain otherwise unconvinced! I have only Friday evening to finish this, fingers crossed. 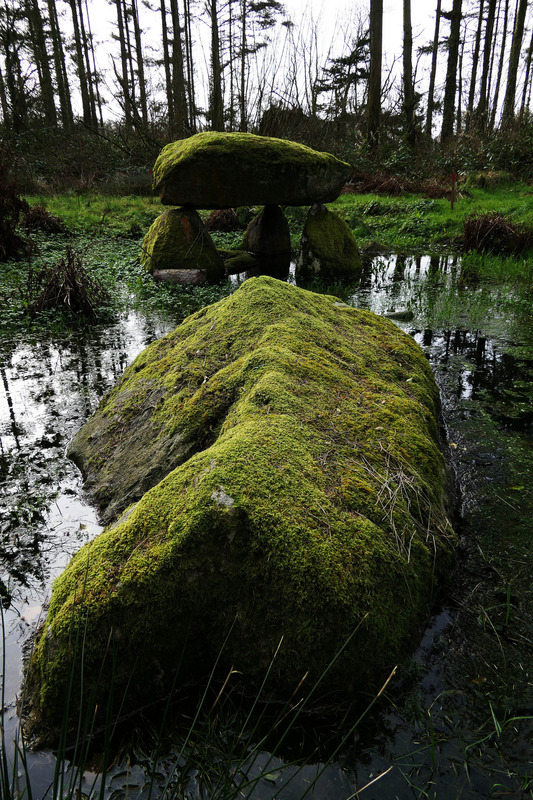 Uh oh, a sacrificial offering stone in the middle. It's pretty corny I know, it's how I got it though, that's my line of defense! Hey guys, here’s me again reporting with another update. 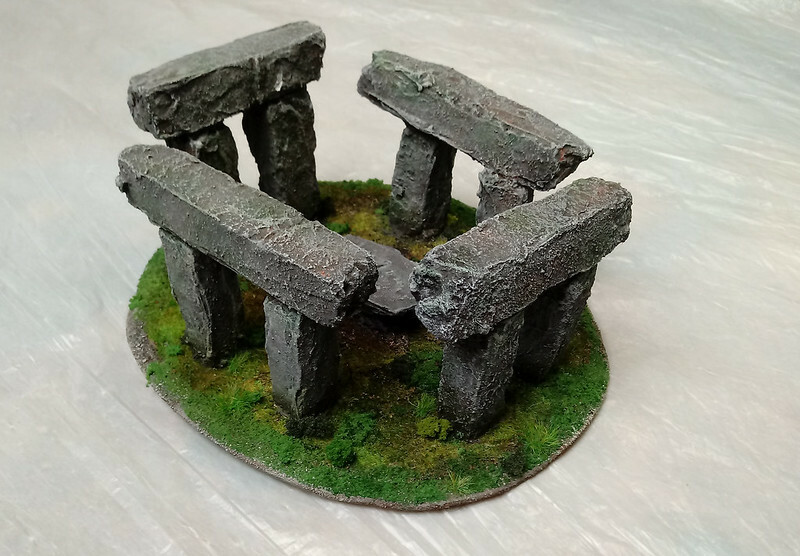 So, for better or for worse the cromlech circle is done! I think it still looks kinda crap but hey! At least it’s better than what I was playing on before (YES IT IS). I barely managed to finish it before the event, the glue was setting as I was setting up the tables (felt like running a real event heh). I do need to experiment with moss first. Anyways I couldn’t help but making this “before and after” comparison picture, in order to strengthen my belief in the decision to just leave it be for now! The event itself was very fun and relaxed. Maybe even a bit TOO relaxed, as I have troubles recalling some key moments from my later games. Might have something to do with how "lubricated" I was towards the end. Also sheds some light on the issue why I placed next-to-last. Still Malifaux is an absolutely top game, even when you play like a pillock. On other fronts work has not been progressing as much as I’d like, mainly due to my inability to locate the small leaves for the bushes. Paradoxically, the harder it is to find them, the more I’m determined to hunt them down. Seems that my addiction to small pieces of plastic and pewter has been replaced with an addiction to small dyed pieces of sponge. Even harder to explain to the outside world I feel! A bit of work has been done on the house. The roofs are now pretty much finished, apart from filling in a couple of gaps. 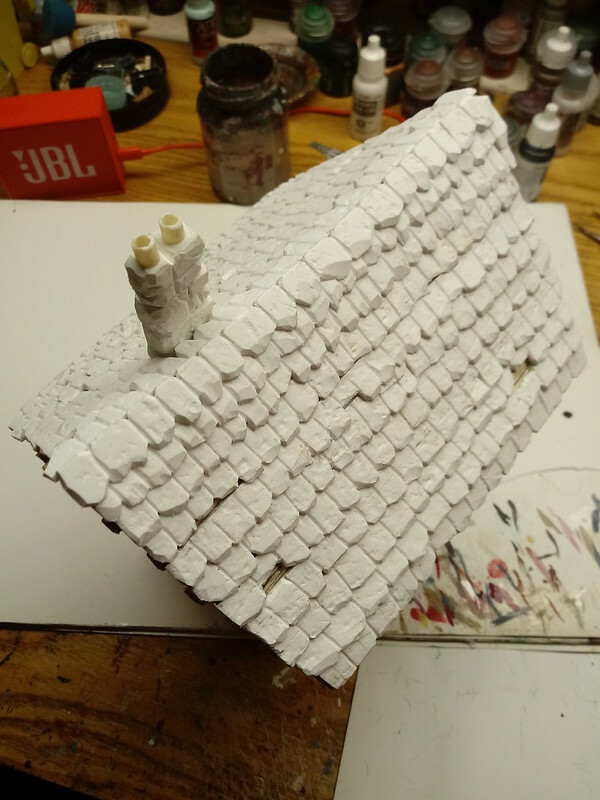 I googled a lot trying to find out how roof spines in slate-tiled roofs should be finished, but as I couldn’t find a definite answer, I just did two rows of tiles and glued them together onto the ridge. 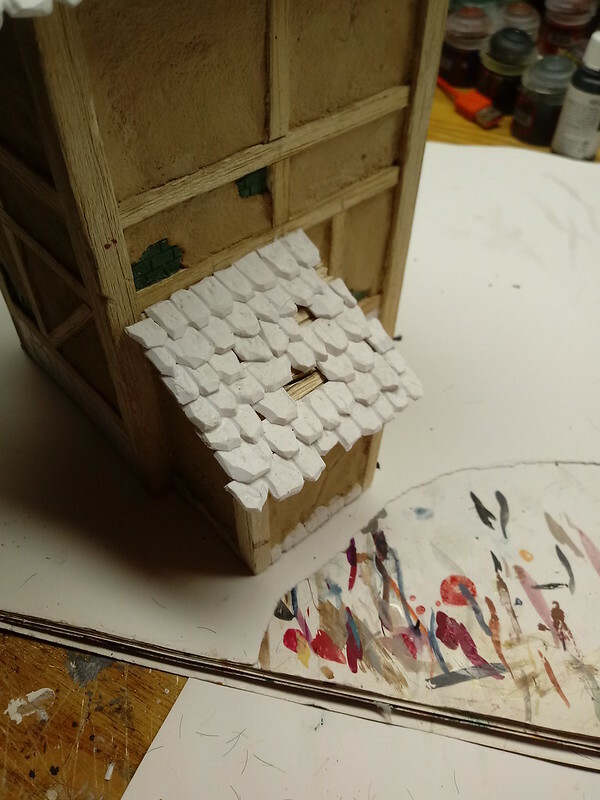 The tiles on the little shed were made using offcuts from the larger roof. I kind of feel like the house is going to be my little “passion project”, in the sense that I will put a bit of more work into it, while I try and power through the rest of my to-do list. Speaking of which, though I didn’t get the leaves, the spray glue did finally arrive. Which allowed me to open a whole new can of worms – TREES! 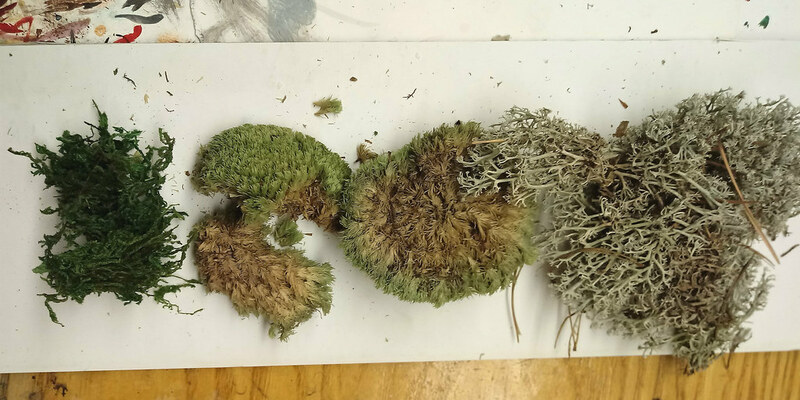 I feel that this is a tougher subject to discuss properly, so allow me to finish here, as I’ll try finding some reference photographs and explain what I’m trying to do. Another update coming real soon, cheers for now! 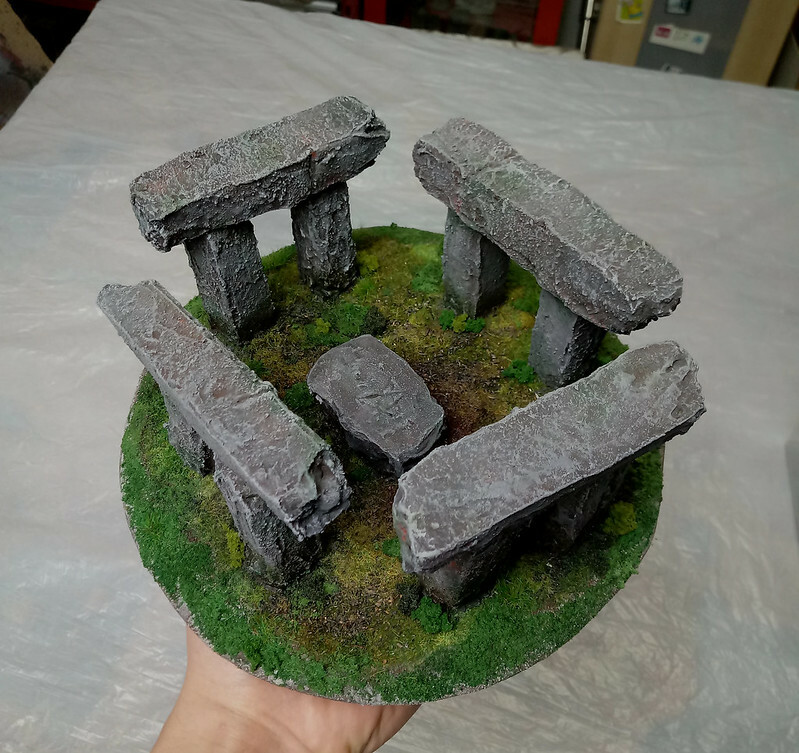 It seems like the mini-Stonehenge circle with sacrificial altar in the center came out better than it was, so congrats! Hey guys, sorry for the absence. I was trying to get a bigger update on the project, but I kept getting side-tracked. Anyways as I was saying – It's time to get some trees done! Very self-explanatory, the bristles of the brush work as branches, you spray the entire thing in glue, dip it into flock and job done. GW used to make these, and I remember always wanting to buy them as a kid. 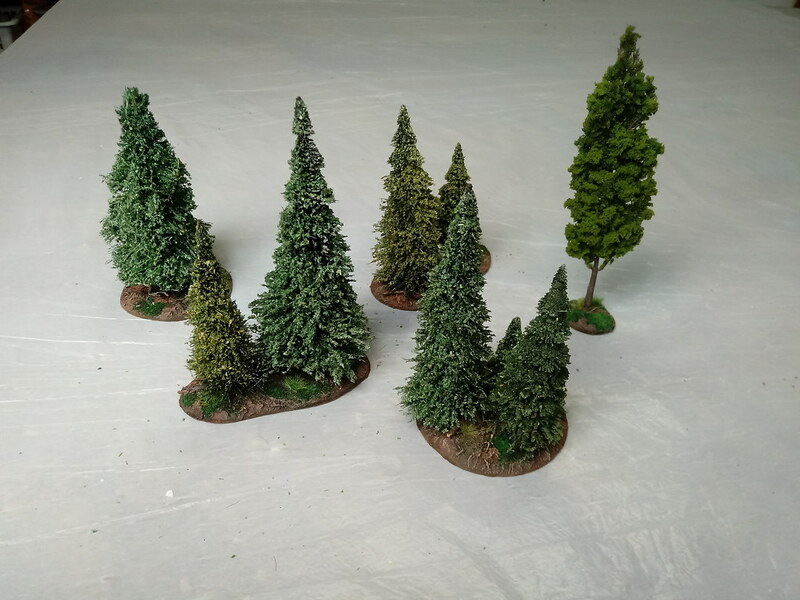 In fact I did buy a set of conifer trees similar to those and they have been kicking around my gaming tables for the past two decades. And they really do look like they have been kicked, punched and mistreated in all possible ways, since by now they have virtually lost all their flock. They’ve kind of transformed back into bottle cleaners at this point. I decided that they can be pressed into service once more, after I’ve replaced the flock they lost. So out comes the Fast Tak spray and some coloured sawdust I had lying about. The sawdust is ancient stuff, but I feel it looks pretty good on conifer trees – not so much for deciduous trees (more about that later). I decided to use different colours in order to make them look more natural. After they dried I sealed them using a scenic glue recipe I’ve nicked from some of the youtubers – essentially 3:1 PVA glue and water and some washing liquid. I tried securing the flock using hair spray and artists fixative, but for some reason they had a reverse effect from what I was going for and my test tree lost all its “needles”. Perhaps it’s the solvents in these particular spray cans, that reacted with the spray glue? No idea. Anyways the watered down PVA works okay, although some of the flock is still coming off annoyingly. Perhaps I should do another coat? The glue can leave some white marks if there is too much of it, so I am somewhat hesitant to try it a second time. I was really pondering on how to texture them, as I wanted to go for a slightly different and more “foresty” type of ground, to differentiate from the other terrain features I’m doing. So then I stumbled upon this video: https://youtu.be/ToF1Do_HPag. I wholeheartedly recommend watching it, as this guy’s attention to detail puts my measly efforts to shame! The end effect is spectacular, although the amount of work is also pretty staggering. I decided I want to do something similar, but also simpler. I figured that I would try adding some exposed roots first. You can often see this effect with conifer trees, as they root themselves pretty shallow. 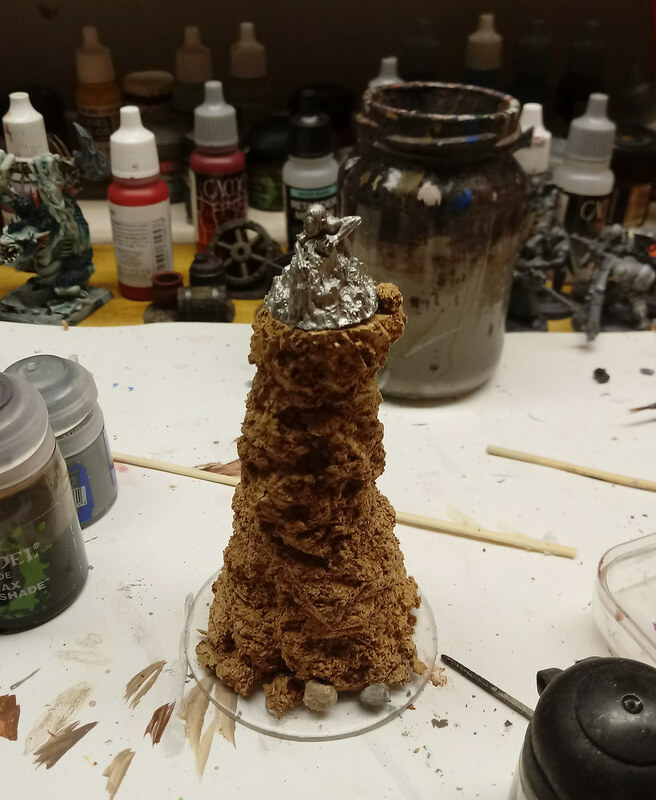 I used DAS for sculpting, which is an air-hardening clay, roughly rolling out some of it and pushing it onto the bases. To make the roots stick to the MDF surface, it is necessary to dampen it first by brushing on a bit of water. After I was happy with their general shape, I let it set for 24h. Next was the groundcover. Like in the film above, I did my muddy groundcover by mixing filler with various materials to increase volume and add texture. I essentially used chinchilla sand again, but also blended wood fiber (also from the pet store), which I dyed using inks and water first. 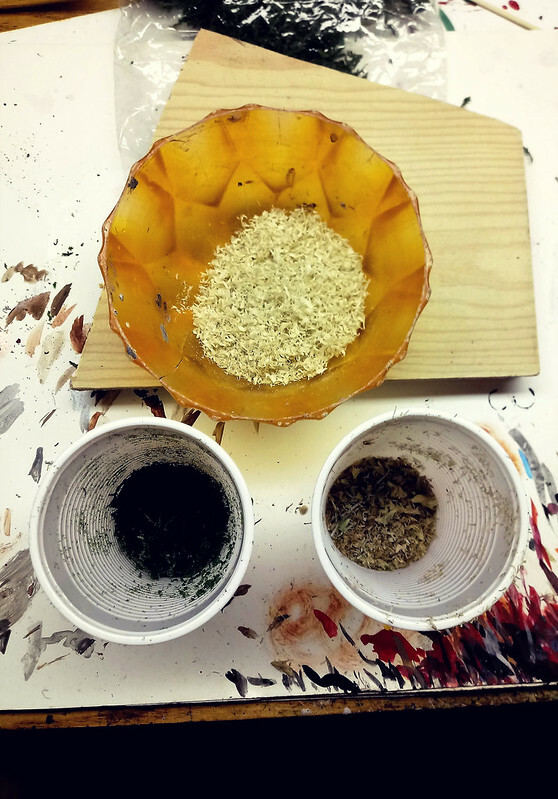 Three different types of dried moss were also chopped up and thrown into the mix, with a couple drops of raw umber and a bit of green for good measure. 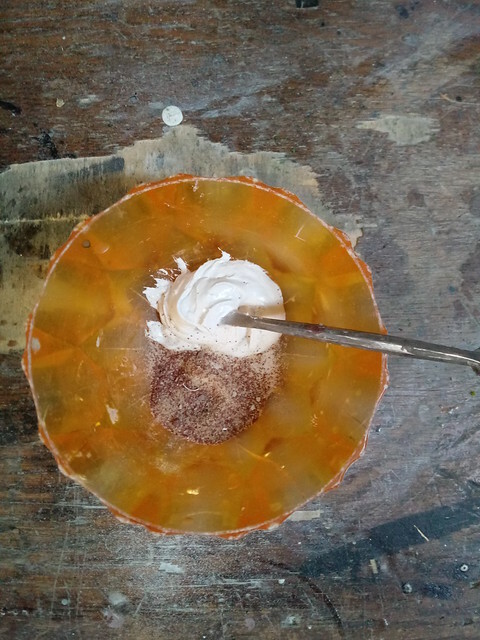 After all was thoroughly mixed, I applied this messy substance to the bases using a putty-knife. 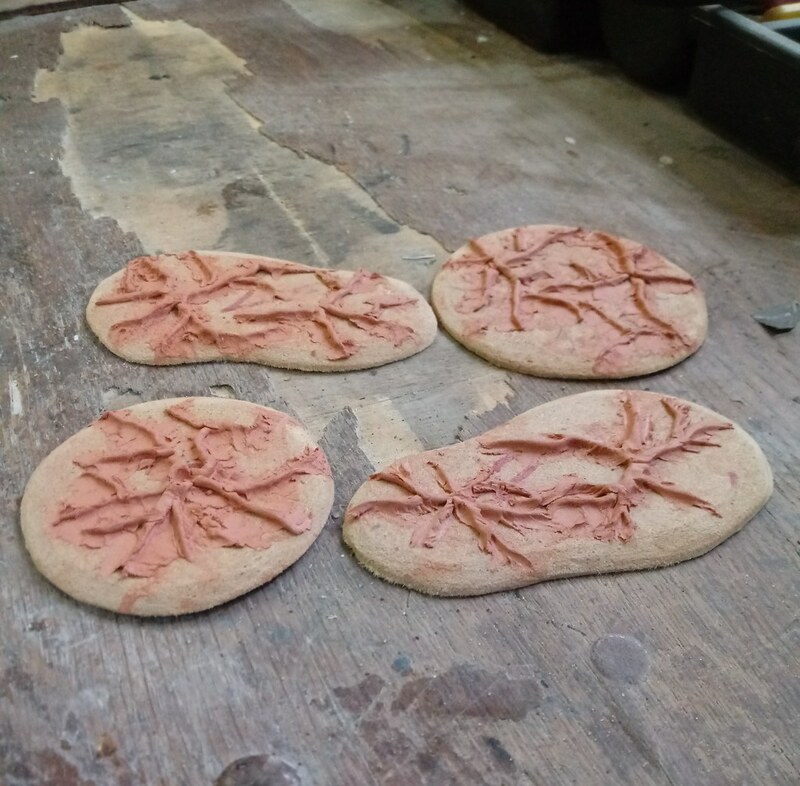 I also should mention that I did paint over them with watered down PVA so that they wouldn’t chip. I should’ve probably roughened the bases first, to help with adhesion, but I didn’t think about it really. Painting up next. Since I’ve already added paint in the mixing process, this went pretty quickly. I was able to get some pretty good colours using simple glazes with watered down paints. A pretty random mix of craft store black, dark browns, reds and greens to be precise. I drybrushed the bases using a sandy Vallejo colour. The roots were picked out with Reaper Volcano Brown and highlighted in Reaper Ashen Brown. I think for a spooky dead forest this would’ve been enough. But since I’m doing more of a summer theme, I wanted to build up some resemblance of moss patches, by sprinkling the fine turf blends onto selected areas. I also added little twigs (made from dried roots), and a couple of clumps of static grass. I knew most of the base was gonna be obscured anyways, but I was just curious what effect could I get with a little bit more work. With the bases done, it was time to drill little holes and mount my trees at last! WHEW!!! And here they are, the first batch of trees all done!!! The final pic didn't turn so well - I will do a better group shot soon! Those bases are awesome. Like the reuse of the trees as well. 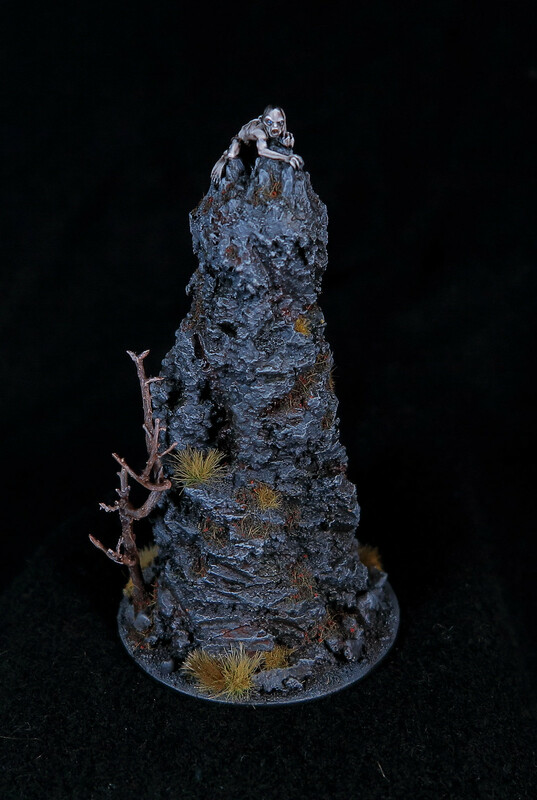 I’m all for the smaller bases for the trees. Thanks for showing how you did them. Inspiring! Many thanks for the nice words gents! I'm happy to share my process with you, I am pretty much learning as I go . 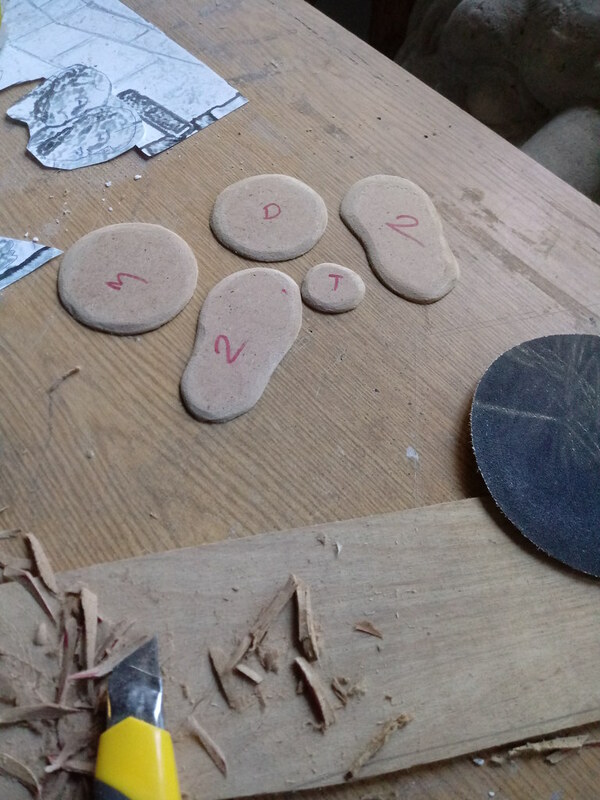 It's going to be a bit of a hassle fitting my irregular bases into individually cut holes. Plus I can just dump whichever trees I want onto a big flat base, making the forest look different each time. But then it can't have too much texture on it, as the smaller bases wouldn't sit flat, which would of course annoy me foreeever . 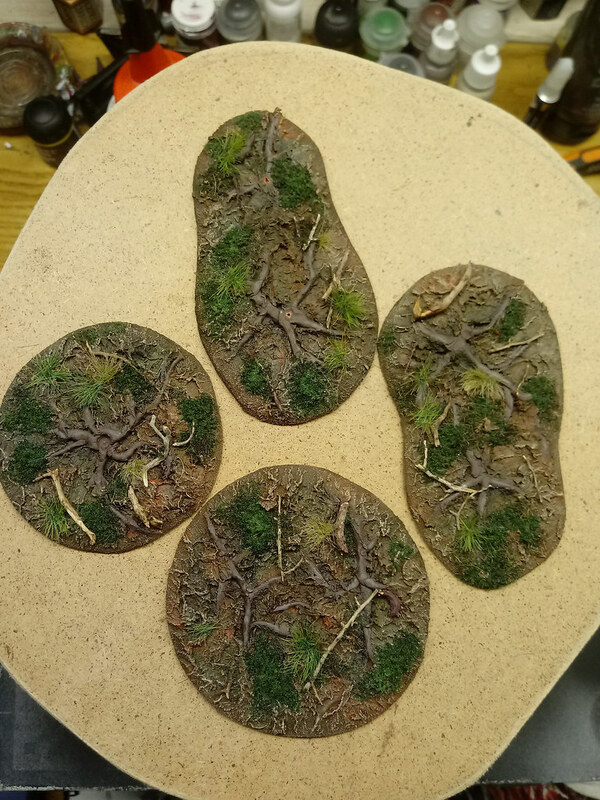 Not sure if this helps, but I'm doing a dozen of individual trees on regular 40mm round bases, and intend to do two or three larger woods bases with sunken base holes for the individual trees. So modular throughout. I want to do a couple of smaller woods, similar to yours, with two or three trees each. But the larger woods I'll do regular/modular, in order not to 'waste' the trees if I don't want to use the larger woods. Thanks a lot for the tips, that's probably how I'll go about making my larger bases . I do need to produce more trees first, so I can pick an choose which ones go where. I also have the plastic GW forest. 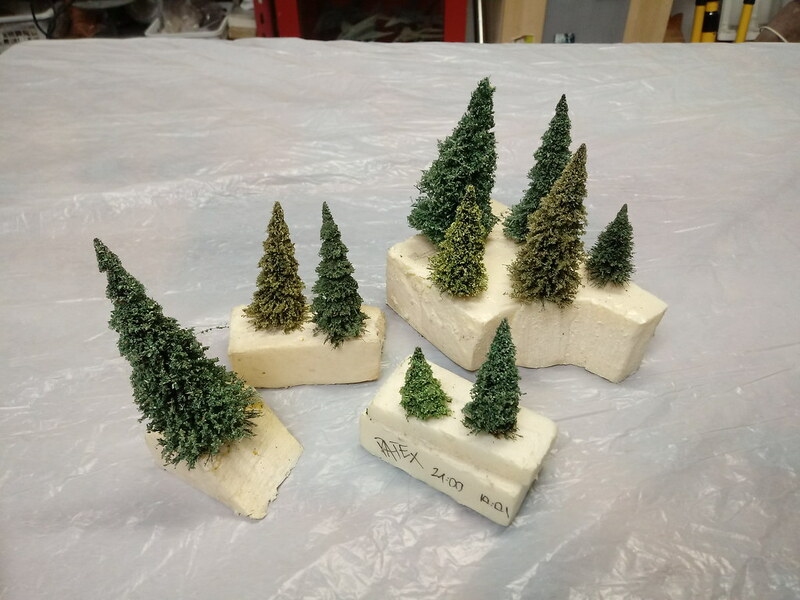 I am intending on using the trees for a different project, but I might paint up the base and use it to make three forests, instead of the planned two. 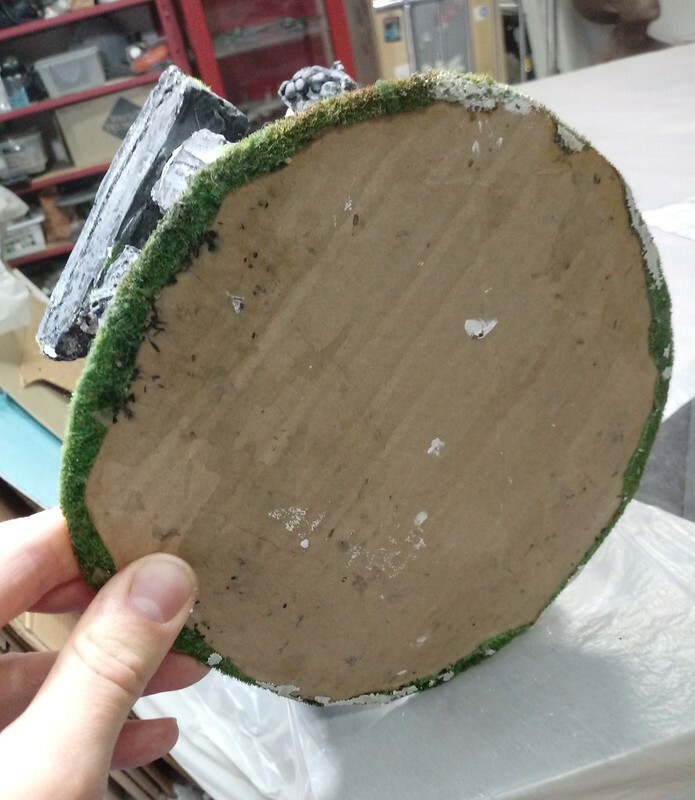 4Ground have or had a product of some wood bases, with two layers of mdf - a shaped bottom layer and then an upper layer with either 2 or 3 60mm circular cut outs for the trees. Just had a hunt around their website, and I cannot find them - I hope they haven't dropped them. 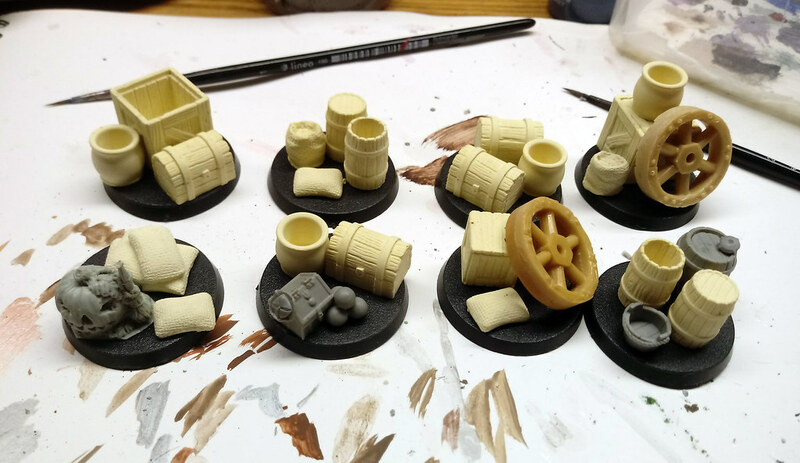 I bought several and have then got extra 60mm plastic round bases from Renedra. 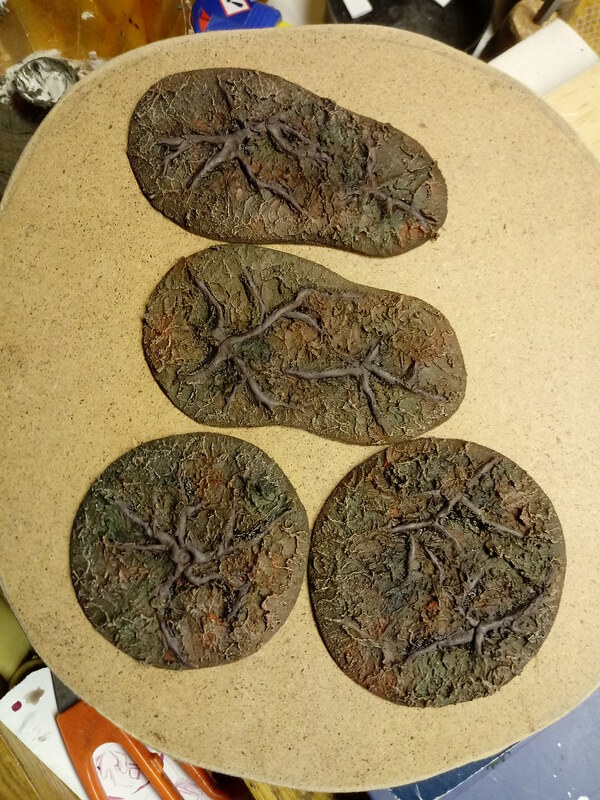 So using a couple of set ground covers for the overall bases, I am able to use a variety of 60mm based 'trees' for the scenic effect. Firstly I have a sort of sand finish, into which I can choose to drop Palm Trees for a desert look, or Cactus for a Wild West board. 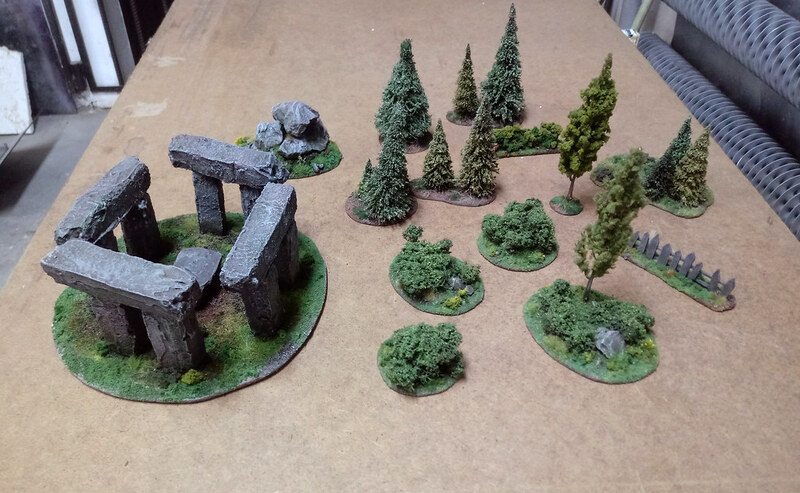 Similarly I can swap my other set of bases from Pine, to Deciduous, or Jungle. The actual 'trees' can obviously lift out if you want to move troops through the woods. The curves on the bases can come together to make larger forests if need. Bit late now as you have done your bases, but it might be a good solution to make your efforts simpler to do in the future. 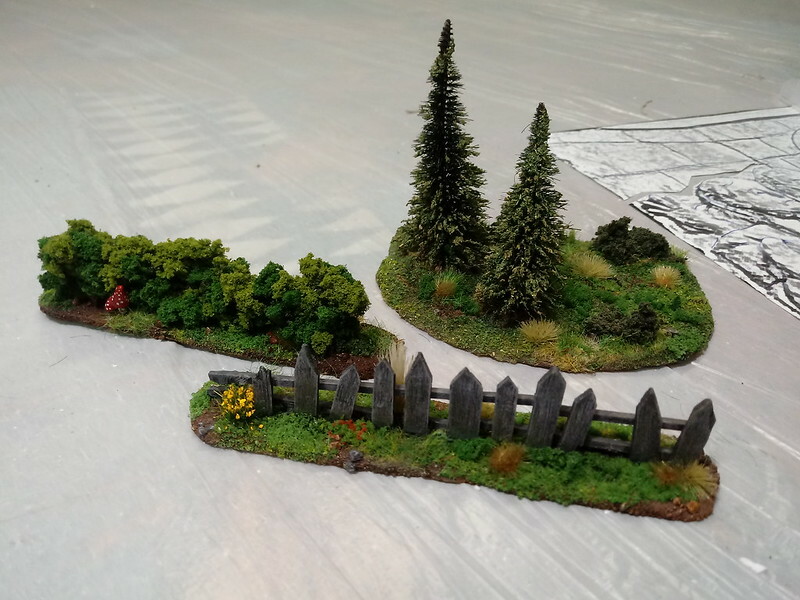 Your skill with actually doing the flocking and basing would be helped by ready-made bases to avoid tricky cut and fits. What an awesome thread. Can’t believe I didnt see this before! Thanks for the tips about the 4ground stuff. I think it’ll be easier for me to just do this myself, but I will keep them in mind. Anyways work hasn’t progressed much on anything terrain-related recently and I feel bad. In my defence, I did manage to play some games over the past weeks. This even included a nice 1500 game of greenskins vs skaven, where the nasty ratmen managed to overcome my forces narrowly. Poor gobbos! At least Queek got run down by squig hoppers to his ignominy. I have to get back to work again though, as me and my buds are embarking on a Real Warhammer CampaginTM pretty soon. Which I am supposedly running. Am I up to the task ? It’s not as much as I’d hope to get done, but it’s still something. I did manage to add some foliage to the bushes, thus completing the first two points on my checklist – huzzazh! I’ve also churned out nearly 50% of the trees planned. Now I just need to force myself to get the remainder done, but I also feel like I’m getting nowhere with my painting recently. Why aren’t there more hours in a day? Gotta have them finished by Saturday morning, so there’s bound to be some form of update soon. As always – thanks for reading. Really like where this is going! Good to see the finished items all in the one photo. Basecoated, washed and drybrushed. Nothing fancy.. As you can see there are only 5 instead of the planned 8, as thankfully my friends assured me they will bring some suitable objectives with them (which they did). I might add some static grass to these at some point, but I'm pretty okay with how they look for now. The initial game of our campagin was a blast . Ditching 9th in favour of 8th allowed us to have some fun with special characters. Tyrion and Queek took to the field, as did Snagla Grobspit on my part. I played Gobbos vs High elves, unfortunately a wild animosity roll caused my bunker unit to make a wild charge, thus on turn 2 I've lost my mage, general and BSB. Later I did play the objective game better and managed to go down only 12:8. On the other table the Skaven dispatched their Wood Elf opponents relatively easly, with Queek's Stormvermin cutting a bloody path throughout the battlefield. Next battle in roughly a month, gotta get working on more terrain! Where are the big wheels from on the objective markers? I have a steam tank sitting on blocks and these look like they might fit the bill. The wheels I bought online, ages ago from an auction. Haven't seen them since. I have a bunch that I'm likely never going to use (they're too big for chariots). I can send you some, PM me and we'll talk . Life is keeping me away from toy soldiers and terrain building (sad face) and sadly there is no progress on my quest for a decent gaming table. 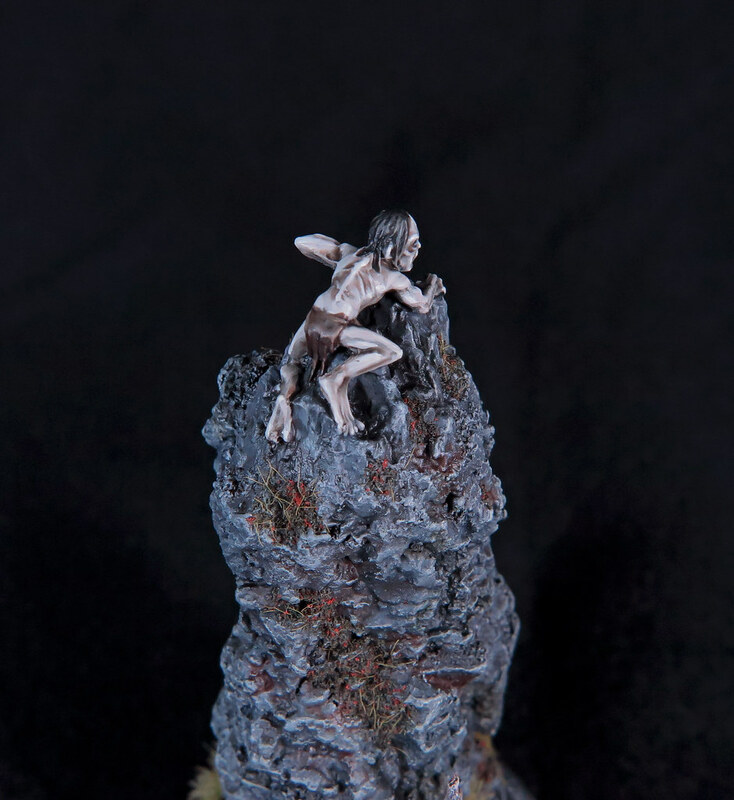 I did however create something recently, that involves miniature scenery, which I think might be of interest to ya all. The brother of my significant other had his 30th birthday recently. As a gift I’ve built him a little LOTR themed diorama (he’s a big fan of Gollum). The scene I was trying to emulate was when Gollum was tracking Sam and Frodo through Emyn Muil. 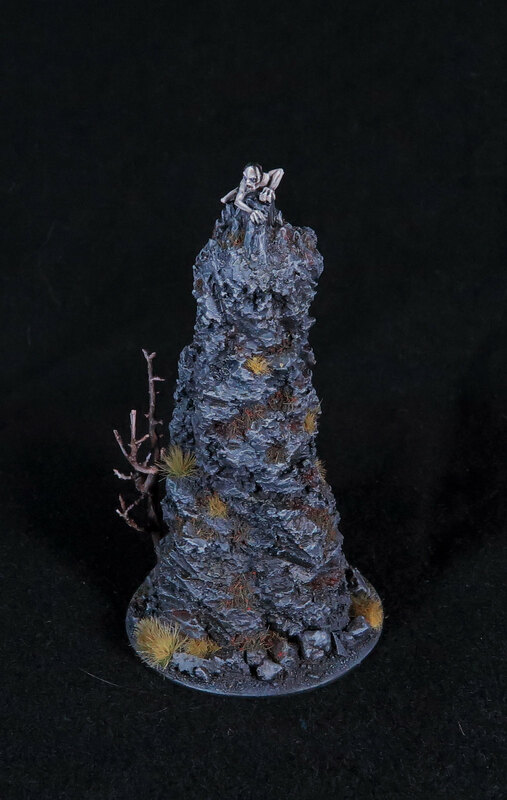 The miniature is GW’s obviously, while the main structure of the rocky outcrop was built out of cork. Its surface was chiselled and chipped, and then covered with watered down spackle, to make it more robust. 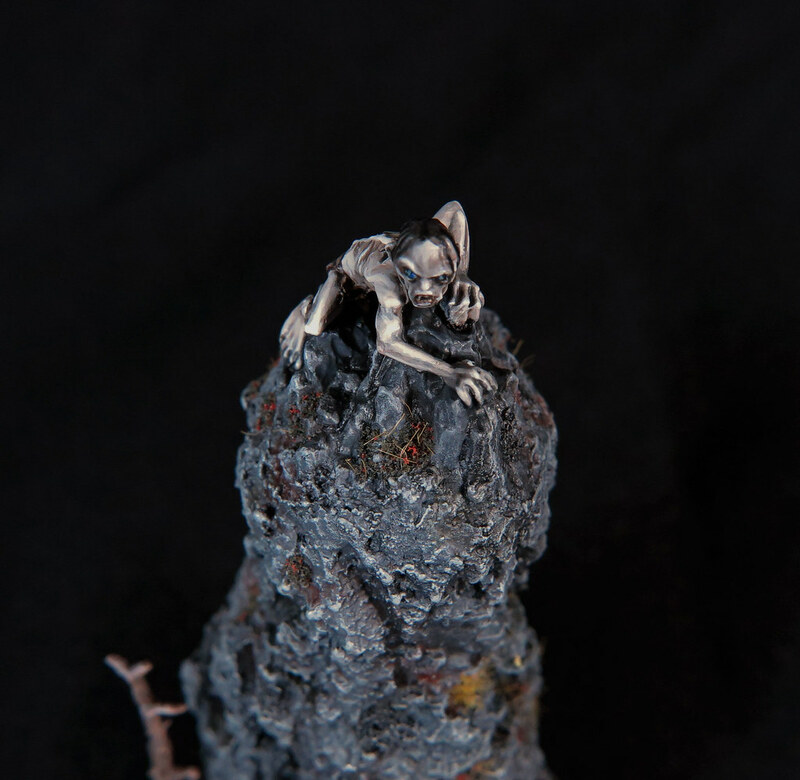 It also helped blending the miniature's base with the cork. The painting was my usual process of layering various greys and browns – only this time I used an airbrush as I was pressed for time. Washes and drybrushes were used to finish off the painting part. 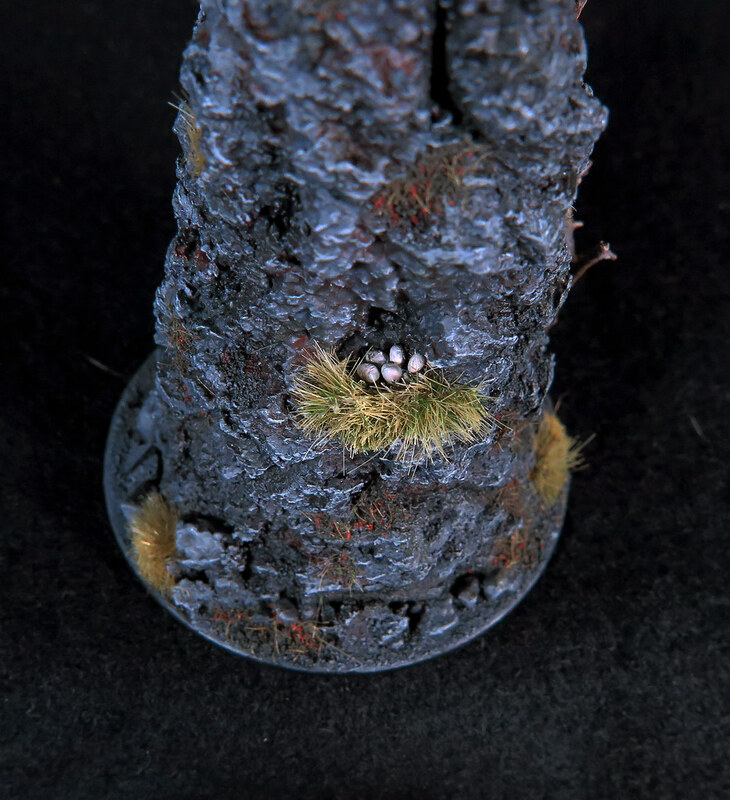 I’ve used 5 kinds of different tufts and a mossy blend from gale force 9 to add a bit of vegetation. The tree is made from a piece of desert root that was covered in watered down PVA and painted. I've also constructed a little nest with some static grass and by adding a couple of eggs made of green stuff. I must say I am very pleased with how the piece turned out. I think the combination of cork and spackle looks pretty darn realistic. I will try to use this technique for my future hills (see, there is a vague link to the actual subject of my blog)! I've also discovered that I love doing dioramas! I will deffinietly have another go at this in the future. 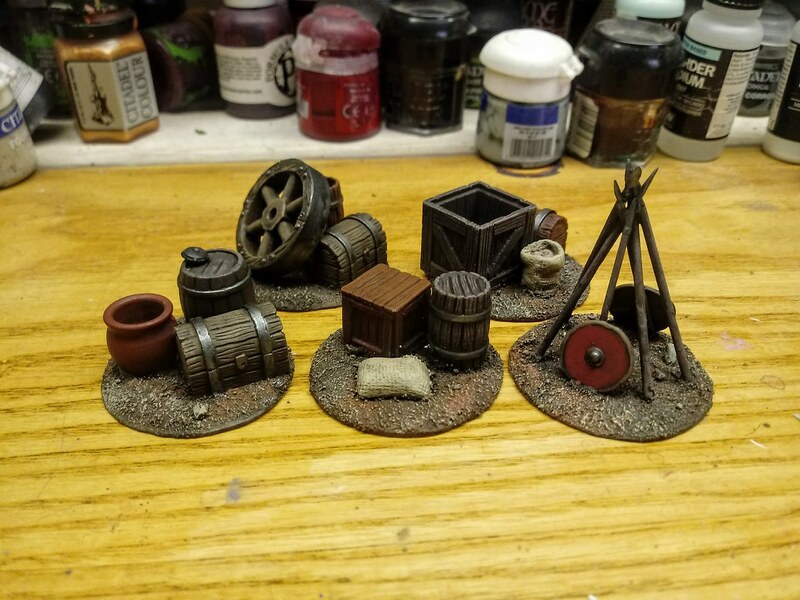 Fantastic - just from one mini, some tufts and easy to find general DIY stuff.